The Townhouse on Buchannan Street has undergone a truly breathtaking transformation into the largest Thai restaurant in Europe, Chaophraya. Admittedly this didn’t really impressive me. Truthfully I couldn’t shake its previous life as a jumbled shop. But when I enter the impressive lobby adorned in luxurious décor and stunning chandeliers – with an elephant thrown in for good measure – well, all memories of its previous incarnation fade from my memory. 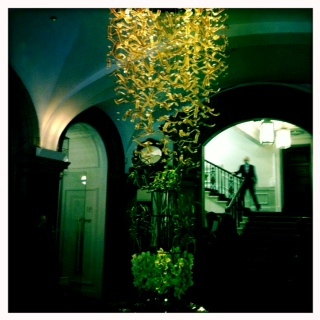 The service is very attentive – in fact, we’re escorted up the main staircase to our table. And even though it’s spacious with high ceilings and vast fireplaces, the dining area somehow still manages to feel intimate and welcoming. The menu is huge with a great selection for all appetites, including veggies. 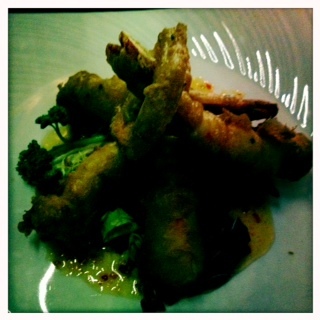 I cannot resist the Tempura Prawns (£8.50) to start, followed by Seua Rong Hai, Weeping Tiger (£15.95). Yes a little on the expensive side, but the total experience is lush and the food lives up to the surroundings – in a word – exquisite. Not only does each dish look amazing but it taste sensational, the perfect fusion of competing flavours in every mouth-full. The whole experience feels very decadent – a spectacular setting, gorgeous food and dutiful staff. And you can continue your night in the Palm Sugar Lounge or for something a little more intimate book rooms for private dining. And for the romantics, there’s even a balcony for two! But be warned, Chaophraya isn’t a secret and you’ll definitely need to book to avoid disappointment. The truth is in the tasting – but it’s not just food. The spectacular setting and the lovely staff make it utterly perfect. The days are getting shorter and the weather has taken a turn for the even worse – but there’s still reason to feel alright if you’re heading to the Tiki Bar in Glasgow. This wee tropical hide-a-way at the end of Bath Street is easy to miss – if not for the giant Easter Island head (Moai) guarding the outside entry. And even then, if there’s no one outside because the weather is the pits (which is quite possible), you could easily pass by the luminous green door. But do open it to the most wonderful basement bar, turning out tasty Thai treats in extraordinary surroundings. The décor is Americano meets island boy and has pin-up-girl daughter extrovert. Buxom 1940s poster girls are interspersed with glowing blowfish lamps and the ultimate in geek chic, Mad Magazine’s toothy freckled-face boy. The downstairs bar is a softly lit snug, comfy place. And upstairs the open-space restaurant is like stepping into a friend’s house – if that friend happened to live in the 1940’s, loved to collect robots and interesting art and had a knack for making killer Thai food. Adding to the wonder of this quirky place is their fantastic staff and dare I say even more divine cocktails . And fellas, before you turn up your noses to girlie drinks, you haven’t had a Tiki Bar cocktail. 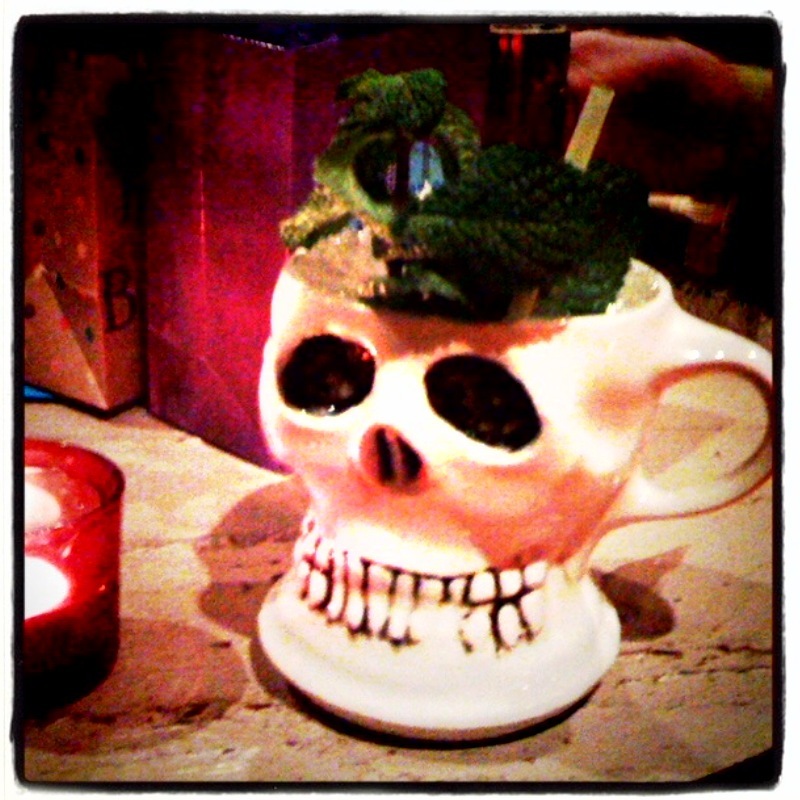 Not only are they delicious and packing a potent punch, but they are served in the ultimate glasses – my gin and juice came in a ceramic skull. How’s that for manly. Of course for the less daring, there’s always beer. And then there’s the food – absolute yum! Top dinner recommendations would be starting with the king prawn tempura (£6.00), which should be renamed ultimate champion king of kings prawns, the crispy golden spring rolls (£4.80) or the oh-so-good Fish Cakes (£6.00). And for a main you can’t go wrong with the divinely delicious tofu and vegetable red curry or the flavourful coley with three flavoured sauce fish dish (£10.20). If after that you can muster a dessert (well done), do let me know what’s best! I opted for more cocktails. So if you’re looking to escape looming autumn blues and shake off cold and constant rain, then get yourself to the Tiki Bar! Cocktails reign supreme, are served in attention-grabbing glasses and the food is rock-your-socks off good but won’t force you to wonder home barefoot and broke! And while, yes, technically their Thai cuisine may not be authenticly Hawaiian – there’s no denying that it is 100% fantastic! 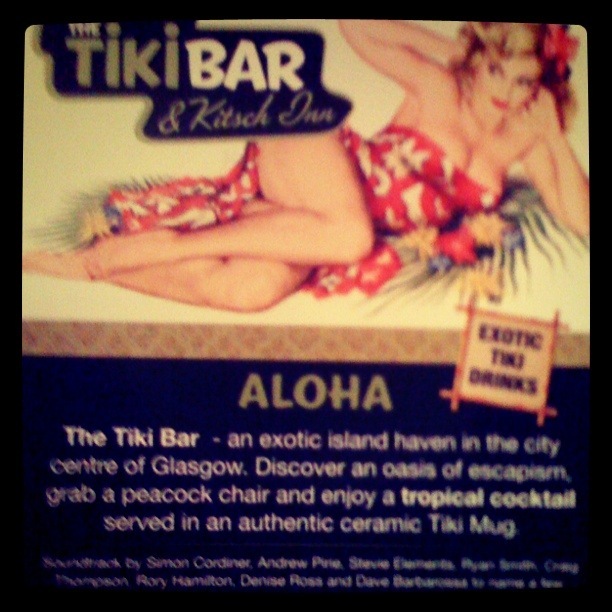 Although I’m totally getting ahead of myself – I’m hoping that summer 2012 will be a scorcher because incidentally the Tiki Bar also has one of the best outdoor areas in Glasgow and will give places on Ashton Lane and the city centre’s Chinaskis a run for their money!